Michiko Miyagi was born April 12, 1926 as the sixth child of the family in Kadena-cho, Okinawa formerly called, Yara, Chatan-son in Okinawa. While she was in the fourth grade at the Okinawa Prefectural Shuri Womens' High School, she was drafted to serve as student troops, called Zuisen Student Troops, in The 62nd Division of The 32nd Japanese Army, called Rock Corps in 1945. The 41st graduation ceremony of Shuri Womens' High School was held in the Nagera cave of the field hospital in the middle of the heavy bombing by the Allies. 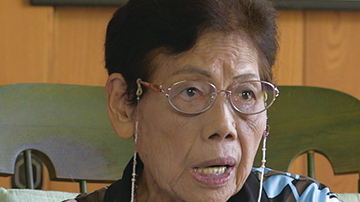 Michiko had survived while 33 of her schoolmates got killed out of the total of 61 students of Zuisen Student Troops. She studied at Okinawa Education School, former University of the Ryukyus after the end of the war. She taught as a teacher at an elementary school till she had retired. She worked hard for the antiwar peace movement as a storyteller of the Battle of Okinawa after she retired. The NHK Okinawa TV station in the program of “Moving Images of the 20th Century/Okinawa” reported her antiwar peace movement activity. The Ministry of Education introduced details of her activity in a book titled “Introduction to the Lifelong Learning in the 21 Century” published. She retired from a storyteller after her 300th lecture in 2010. “Never let the land of Okinawa as a battlefield. Never let anyone go to the battlefield from Okinawa. Win a victory of peace without depending on the balance of the power.” she says. She thinks it’s her duty making every single effort to make these things happen as a survivor of the war. What she can do now is to talk about the fear and emptiness of war to the children who ought to build the future of the world. She thinks it means a lot for the young Japanese and soldiers who lost their lives for the government of Japan during the war, and the kids these days who doesn’t know what the war is like. Yui Kakazu was a highschool girl in Okinawa when we filmed her. She did great job by acting a student troops who had suffered under the storm of the bombs and bullets. It was her first experience crawling in the yam potato field, walkimng up and down the dark wet cave, walking through the sugarcane field being scratched by the leaves of them. 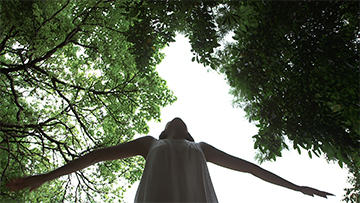 We met Aya through Masahisa Aikawa, a friend of our DP, Takuro Iwagami in Naha, Okinawa. We explained the idea of dance, which was a memorial dance for Michiko's schoolmates and all the people who had killed without cause. She understood the meaning of it and created amazing choreography. We believe that her dance could heal the souls of the dead. Aya has been dancing here and there. We had hard time finding high school girls who could appear in the film. It took us for a long time finding a high school which allowed girls to appear in the film, because of the stalker issue. They said more high school girls had problems caused by stalkers since more images of girls had been up loaded on the internet. The faculty at Tomishiro High School was brave enough to challenge by letting us shoot their girls. Girls from Volleyball club and other sporting clubs performed for us and showed their powerful energy in front of the camera.